Carte de L'Asie Mineure Ancienne. 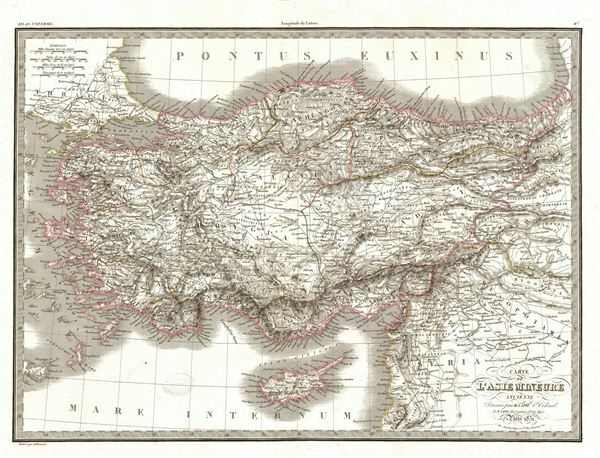 A fine first edition example of M. Lapie's 1830 map of Asia Minor in Antiquity. This map covers from the Aegean Sea to Mesopotamia and from the Black Sea (Pontus euxinus) to Cyprus and Lebanon. Lapie shows the ancient Kingdoms of Asia Minor, many of which were Greek colonies or heavily influenced by Ancient Greek culture. These include Lydia, Lycia, Caria, Mysia, Phrygia, Cappadocia, and many others. This map was engraved by Armand Joseph Lallemand as plate no. 011 in the first edition of M. Lapie's important Atlas Universel. This map, like all maps from the Atlas Universel features an embossed stamp from the Lapie firm. Rumsey 2174.011. Phillips (Atlases) 754, 765.